Western Australia’s Great Southern Police recently launched the ‘2 Close’ project in the state’s south aimed at increasing road safety and reducing trauma rates on the local road network. The theme of the multi-agency project is to discourage drivers who persist in aggressive tailgating and driving ‘2 Close’ to the vehicle in front, especially behind agricultural and haulage vehicles. "Tailgating is undoubtedly one of the most dangerous and foolish examples of bad driving we see every day on our roads and highways," Senior Constable Tam McKeown says. "It is also recognised as one of the biggest factors in triggering road rage and intimidating other motorists." A former winner of WA’s police officer of the year, McKeown says the project is designed to encourage the motoring public to drive at an appropriate speed, where they can always stop their vehicle in the distance they can see to be clear. The high visibility ‘RU 2 CLOSE’ signs are clear and concise, which encourages drivers to take notice and reflect on their manner of driving. "We have high hopes that the project will spread to other areas of the state and beyond," McKeown says. He says local coach and haulage operators have been the major driving influences in getting the message out on the road networks by displaying signage on their vehicles. "Driving too close is a primary factor in many road collisions and is often associated with inappropriate speed for the road and traffic conditions. "This becomes particularly problematic as the weather changes from dry to wet roads, or during sustained agricultural activity in our rural communities, such as harvest and seeding periods." 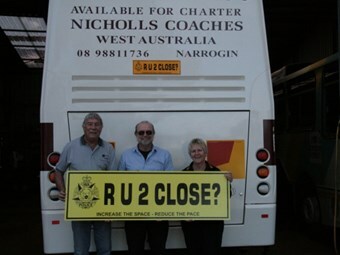 As part of the project, tens of thousands of rear wind screen ‘RU 2 CLOSE?’ stickers have been distributed to the motoring public throughout many areas of WA’s Great Southern region. Larger magnetic signs have been distributed to the agricultural and haulage sector for display on the rear of trucks. This is designed to create a high impact awareness of the project on the road network. Wickepin Police are currently working on rolling the project out throughout the entire great southern area of WA.